In the last two lessons you were introduced with rendering of custom controls. Often your custom controls consist of input controls that allow users to edit data. The new data entered by the user must be persisted across post backs. In this lesson you will learn just that. LoadPostData: The LoadPostData method allows you to read posted data. The method receives two parameters viz. postDataKey and postCollection. The postDataKey is the ID of the custom control and postCollection contains all the posted data. You can retrieve posted data for your custom control by specifying the postDataKey. The LoadPostData method should return true if the data inside the control has been changed else it should return false. RaisePostDataChangedEvent: The PaisePostDataChangedEvent method is intended to raise an event that indicates that the control data has been changed. This method is raised only if LoadPostData method returns true. 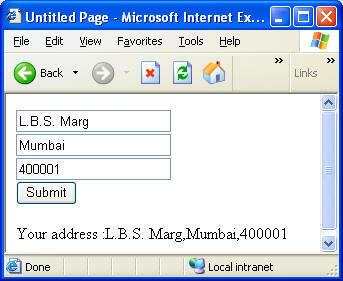 In order to understand how data can be accessed after page post back you are going to build an Address custom control. The control will render three textboxes to enter street address, city and postal code respectively. The entered data must be preserved across post backs. The above code defines AddressControl class inside BinaryIntellect.UI namespace. The AddressControl class inherits from WebControl and also implements IPostBackDataHandler interface. The properties Street, City and PostalCode store their values directly in the ViewState. Notice the use of "as string" in the above code. This way an empty string is returned if the ViewState value is null. In order to display three textboxes for entering the address information you need to override Render() method of the base class. The Render() method simply emits three <INPUT> tags with type as Text. Notice the name attribute of each tag carefully. For the first <INPUT> you set the name attribute to UniqueID property. The other two textboxes simply append city and postalcode to the UniqueID property. This way we can easily retrieve their values later. The value attribute simply contains the value of Street, City and PostalCode properties respectively. Now its time to implement LoadPostData() method. The LoadPostData() method accepts two parameters viz. postDataKey and postCollection. The values after the post back can be retrieved using this name-value collection. Notice how the code retrieves city and postal code by appending "city" and "postalcode" to the postDataKey. The code then checks if any of the values are changed. If the values are changed then it returns true otherwise it returns false. Here you need to check if there are any subscribers for the AddressChanged event. If so you raise the AddressChanged event. Label1.Text = "Your address :" + ac.Street + ","
The MyHandler() method simply displays the entered address in a Label control. That's it! If you run the default web form then it should resemble the following screen shot.